This article will take you through the process of creating a basic ICO on TomoChain — you will sell your own TRC-20 tokens to your investors! An ICO (Initial Coin Offering) is a new way to raise funds for startups. It is the cryptocurrency equivalent to an IPO in the mainstream investment world. A company looking to create a new coin, app, or service launches an ICO. Investors buy the new ICO token, normally with preexisting digital tokens like TOMO. The company holding the ICO uses the investor funds as a means of furthering its goals, launching its product, or starting its digital currency. ICO rounds are similar to venture capitalists (VC) rounds. Tokens are essentially smart contracts that make use of the TomoChain blockchain. The TRC-20 token standard defines a common list of rules for all TomoChain tokens to follow, similar to the ERC-20 standard in Ethereum. The total supply is the total amount of tokens that will exist. For instance, TomoChain’s total supply is 100 million tokens, but currently there are only 58–60 million tokens in circulation. The remaining tokens are locked for different purposes like team reserves, partnerships, masternode and staking rewards, community rewards and more, and will enter in circulation over the next years. ICOs can have one or multiple rounds. For instance, a PreSale round for private investors with some bonus, and later a public Crowdsale. Besides the law, you should take into account the security issue for your smart contracts. Try to make your contracts as simple as possible (security loves simple). The smart contract that we use in this tutorial is very simple and only for education purposes. In fact, the scenario for an ICO is more complicated and you need to test and audit to prevent bugs and you also need to comply with the law and regulations of the country where you sell your token. In this tutorial I will walk you through the steps of setting up your account through to issuing your ICO contract on TomoChain network using simple smart contracts and MetaMask. Truffle, a world class development environment, testing framework and asset pipeline for blockchains using the Ethereum Virtual Machine (EVM), aiming to make life as a developer easier. OpenZeppelin, a battle-tested framework of reusable smart contracts for Ethereum and other EVM blockchains. You will need a wallet address and some tokens. We will show you how to do it on both TomoChain Testnet and Mainnet. 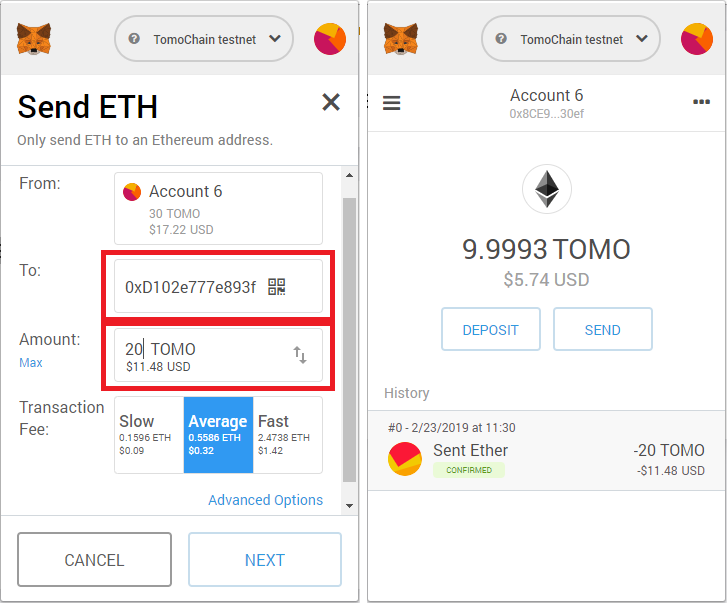 You can create a new TOMO wallet using TomoWallet mobile app for Android or iOS. 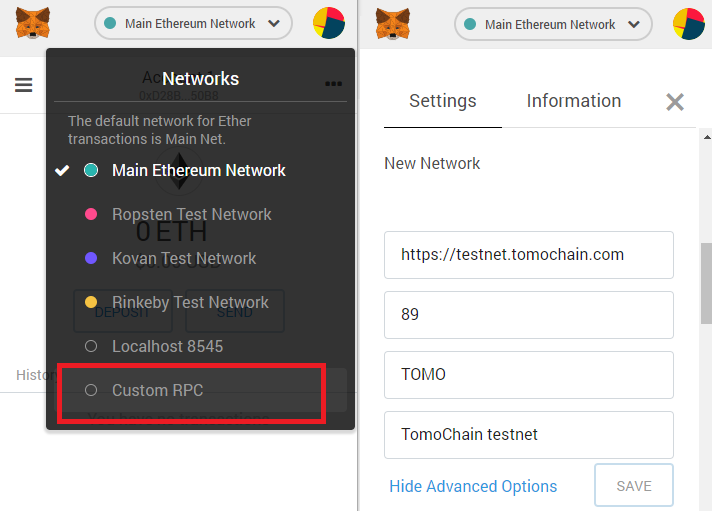 Under Settings go to Advanced Settings, here you can Choose network and select TomoChain TestNet or TomoChain [mainnet]. Go to Settings menu, select Backup wallet and then Continue. Here you can see your wallet’s private key and the 12-word recovery phrase. Write down the 12-word recovery phrase. 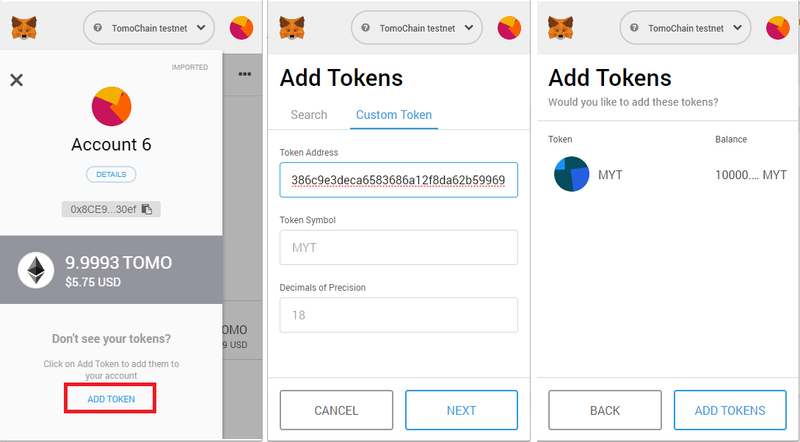 You can also create a new TomoChain wallet with MetaMask, MyEtherWallet or TrustWallet. For instance, for mainnet you can go to MyEtherWallet and select TOMO (tomochain.com) instead of Ethereum. Enter a password and then Create a new wallet. Write down your recovery phrase. Write them down. This will be needed later. Notice that your wallet address and your recovery phrase will be different than mine. ⚠️ Important! Always keep your private key and recovery phrase secret! We will need some tokens for smart contract deployment and also to test later our ICO smart contracts. Testnet: Receive 15 free testnet TOMO tokens using TomoChain’s Faucet. Mainnet: You need real TOMO tokens from exchanges. Go to faucet and collect 60 TOMO. Now your wallet has enough balance to do everything in this tutorial so… let’s go ahead! To check the balance of a wallet address, you can also use TomoScan. Note: Create 2 different TOMO wallets, both with some tokens. The first wallet is to deploy the ICO smart contract or deployment wallet, the second one will be used to test it or buyer wallet. We use and extend OpenZeppelin contracts to create more secure dapps in less time. OpenZeppelin comes with a wide array of smart contracts for various important functions. We’ll be extending now the token contracts to create our own ERC20-compliant (TRC20) token. Go to contracts/ directory and create a new file called MyToken.sol or the name you like. Hold on a minute… Are you telling me that this is the full code of an ERC-20 / TRC-20 token? Exactly. This is the beauty of inheritance and extending OpenZeppelin smart contracts. Currently, see the first few lines? All the code included in openzeppelin-solidity/contracts/token/ERC20/ERC20.sol and openzeppelin-solidity/contracts/token/ERC20/ERC20Detailed can be used and extended (update/overwrite) by this token. We’re extending ERC20, ERC20Detailed and Ownable smart contracts, by OpenZeppelin. This means that we will have all the functionality of those smart contracts plus the code we add to our file MyToken.sol. This code will initialize the token values like name, symbol, decimals (we do this using ERC20Detailed). With the _mint() instruction we are pre-minting (creating) all the initialSupply (the total amount of tokens that will be created). All the tokens will be sent to the wallet address of the MyToken contract. We give the entire supply to the deploying account’s address. Later, we will grant access to these funds to the MyTokenCrowdsale smart contract. To transfer ownership or approve another wallet accesing our smart contract funds, we inherited the Ownable smart contract. Now we are going to write our Crowdsale smart contract. In the contracts/ folder, add a new file called MyTokenCrowdsale (or the name you like). Again, very simple smart contract. We extended OpenZeppelin’s basic Crowdsale and AllowanceCrowdsale. Crowdsale works with rate, wallet (the address of MyTokenCrowdsale contract), token (the TRC-20 token). We extended AllowanceCrowdsale so this contract will be able to access and send tokens stored in another wallet, once approved by the owner of the tokens — which is MyToken. We have selected the name of our token: My Token TRC20. We have chosen the symbol MYT for this token. We assign 18 decimals which is standard. We are also going to create the initial supply: 16'000'000 tokens. But we will only sell half (50%) of them in the Crowdsale. We first deploy MyToken, creating the initial supply: 16'000'000 MYT. Then we deploy MyTokenCrowdsale. Next, we tell MyToken to approve the MyTokenCrowdsale address to access 8'000'000 MYT. This is the max that we will sell in our Crowdsale. Before starting the migration, we need to specify the blockchain where we want to deploy our smart contracts, specify the address to deploy — the wallet we just created, and optionally the gas, gas price, etc. 1. Install Truffle’s HDWalletProvider, a separate npm package to find and sign transactions for addresses derived from a 12-word mnemonic. The official TomoChain documentation — Networks is very handy. Both Testnet and Mainnet network configurations are described there. We need the RPC endpoint, the Chain id and the HD derivation path. 3. Remember to update the truffle.js file using your own wallet recovery phrase. Copy the 12 words obtained previously and paste it as the value of the mnemonic variable. Our Solidity code works perfectly on Ethereum (deploying to Ropsten) and the exact same code works too on TomoChain. — Nice! Totally compatible! ⚠️ Warning: In production, we highly recommend storing the mnemonic in another secret file (loaded from environment variables or a secure secret management system), to reduce the risk of the mnemonic becoming known. If someone knows your mnemonic, they have all of your addresses and private keys! Also, the use of environment variable for mnemonics is a good practice if multiple developers work on the same code stored on a remote repo and they can use their different mnemonics to test/deploy the contract. You can try with npm package dotenv to load an environment variable from an .env file, — then update your truffle.js to use this secret mnemonic. You should have your smart contract already compiled. Otherwise, now it’s a good time to do it with truffle compile. You could also migrate the contract to Ropsten (but first you need a Ropsten wallet with some Ropsten ETH - you can do this on Metamask with faucet). Deployment is waaay faster on TomoChain! Congratulations! 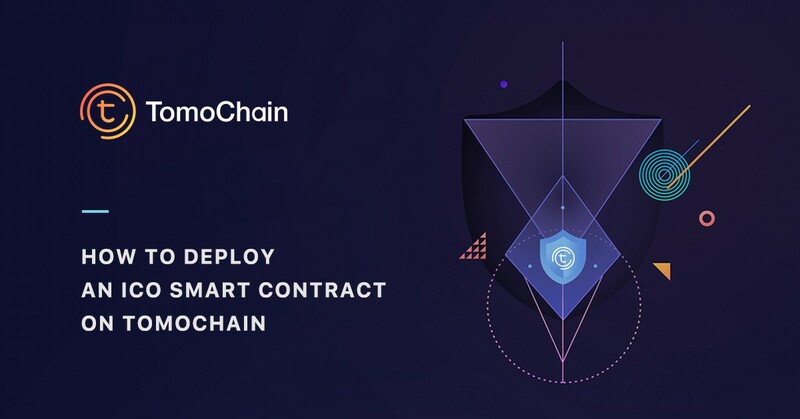 You have already deployed your ICO smart contracts to TomoChain. The deployment fees have costed 27.32 TOMO. Error: smart contract creation cost is under allowance. Why?Increasing transaction fees for smart contract creation is one of the ways TomoChain offers to defend against spamming attacks. Solution: edit truffle.js and add more gas/gasPrice to deploy. Error: insufficient funds for gas * price + value. Why? You don’t have enough tokens in your wallet for gas fees. Solution: you need more funds in your wallet to deploy, go to faucet and get more tokens. If you want to verify that your contracts were deployed successfully, you can check on TomoScan testnet (or mainnet). In the search field, type in the contract address you want to see. Congratulations! You’ve deployed your ICO smart contract and TRC-20 token to TomoChain using Truffle and OpenZeppelin. It’s time to interact now with our ICO smart contract to make sure it does what we want. The code used in this tutorial is just for learning purposes. When writing your ICO contracts take time to test and audit your own code, writing unit tests on test/ folder and auditing your code to prevent bugs or hacks. The last step is testing our ICO. We will buy some MYT tokens with TOMO! 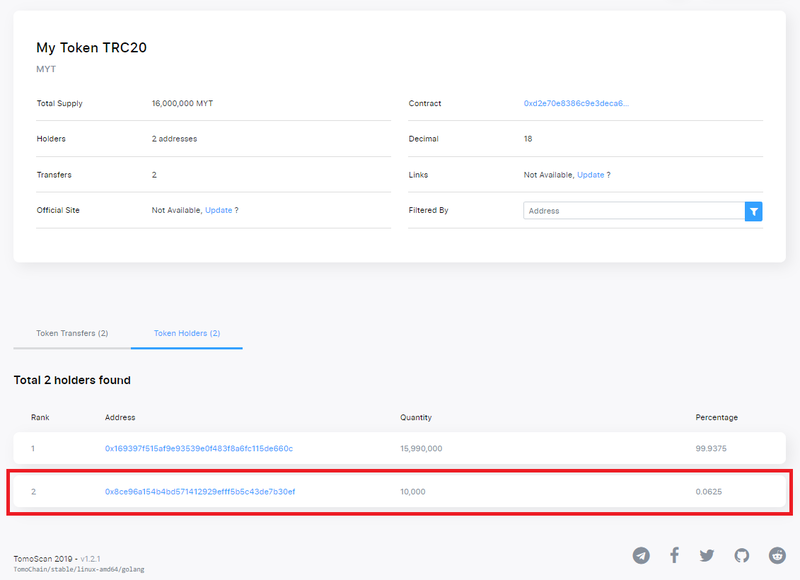 For this, we will directly send some TOMO tokens to the Crowdsale contract address, and the smart contract must send back the new TRC-20 token we created, MYT. The conversion rate is 500. So, if we send 20 TOMO we should receive 20 * 500 = 10'000 MYT in our buyer wallet. Install the MetaMask browser extension in Chrome or FireFox. Once installed, you’ll see the MetaMask fox icon next to your address bar. Click the icon and MetaMask will open up. Create a New password. 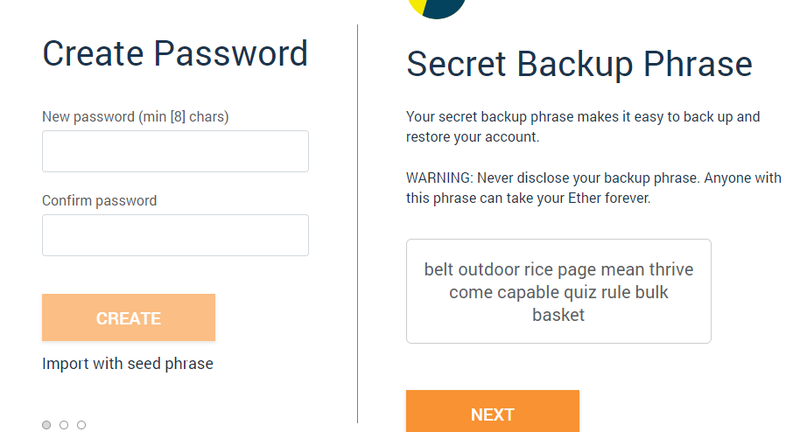 Then, write down the Secret Backup Phrase and accept the terms. By default, MetaMask will create a new Ethereum address for you. 4. Now we’re connected to the Ethereum network,with a brand new wallet. Let’s now connect MetaMask to TomoChain (testnet). 1. Click the menu with the “Main Ethereum Network” and select Custom RPC. Use the Networks data from TomoChain (testnet) and click Save. 2. The network name at the top will switch to say “TomoChain testnet”. 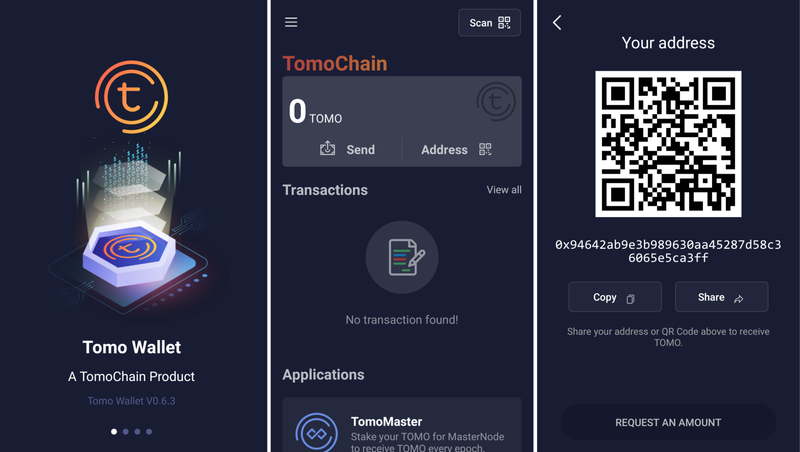 Now that we are on TomoChain network we can import TomoChain wallets. Don’t use the deployment wallet you previously used on truffle.js. Better, create a new TOMO wallet, to separate roles. Create your buyer wallet, if you haven’t already, then go to faucet and add 30 TOMO. 3. Copy the private key of your buyer wallet. Back to MetaMask, click on the top-right circle and select Import Account. Paste the private key and voilà! 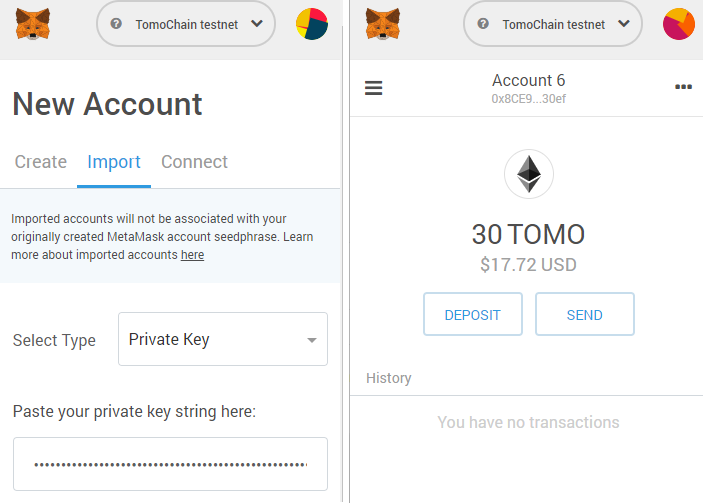 Your TOMO wallet is loaded in MetaMask. We will now buy some MyToken (MYT) from the ICO Crowdsale contract. 2. Go to MetaMask, connecting to TomoChain testnet and using your buyer wallet with enough funds. Click the Send button. 3. Paste the Crowdsale address. Set the amount 20 TOMO you want to send. Select the Transaction Fee (gas, gas price) and click Next. After a few seconds your transaction will be confirmed as successful. You can see the Crowdsale buy transaction. 20 TOMO were sent, and the contract sent 10'000 MYT back to the buyer wallet. 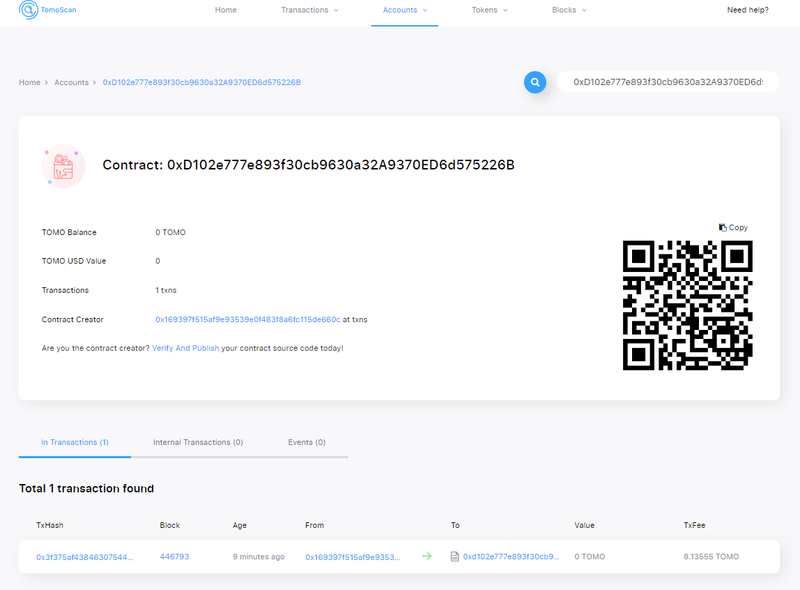 Here is the transaction of this tutorial on TomoScan. To see your new tokens on MetaMask, click the Menu icon on top left (below the Fox face). Click Add Token. Select Custom Token, paste the token address and hit Next. You will see your MYT tokens. Congratulations! The Crowdsale is working! We sent 20 TOMO and we got back 10'000 MYT. set a different rate or bonuses with dates (example: rate: 600 during the first week (20% bonus), and rate: 500 the second week). only allow whitelisted participants to purchase tokens. Useful for putting your KYC / AML whitelist on-chain! More here: Learn about OpenZeppelin Crowdsales. You may also want to set up an ICO website with all the information about the ICO dates, rates, cap, etc. Thanks to Van Cam PHAM.